A senior Serbian politician ignored an entry ban for Kosovo and was dramatically arrested. The issue has sparked tensions between the countries as they attempt to normalize their relations. Serbian President Aleksandar Vucic condemned Kosovo as a "terrorist" and "bandit" state on Monday after it arrested a hardline Serbian government official. The dramatic arrest of Marko Djuric, Belgrade's chief negotiator for Kosovo, has ratcheted up tensions between the two countries as they attempt to make peace. Pristina had banned Djuric from entering the country over nationalist remarks regarded as inflammatory. However Djuric ignored the ban and traveled to the volatile town of Mitrovica for a round table conference on normalizing relations between the countries. 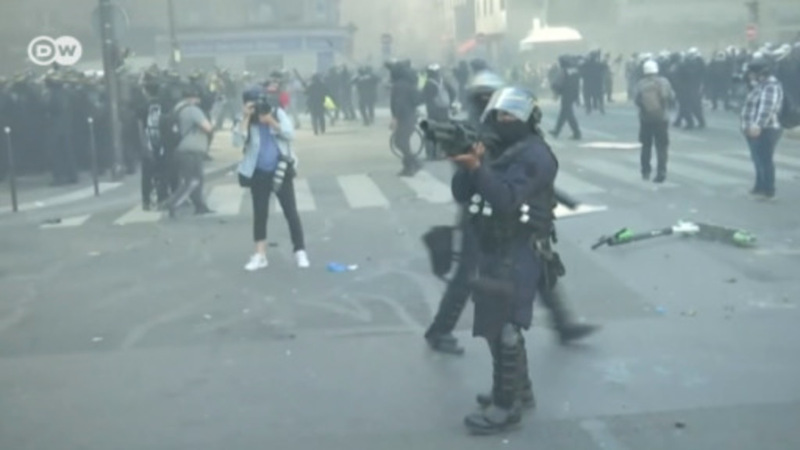 Shortly after the start of the roundtable began, heavily-armed police stormed the venue, arresting Djuric and dispersing protesters with tear gas. He was handcuffed and driven to Pristina in the back of an armored police van to be booed by ethnic Albanian onlookers before being expelled from the country. Serbian President Aleksandar Vucic slammed the use of force, saying Djuric's arrest amounted to an abduction, a "brutal provocation and the worst criminal act," in a strongly-worded address on live TV. "They beat him ... dragged him on the streets of Pristina under boos to complete the humiliation," he said. "All those who have participated in this abduction will be held accountable before Serbian state bodies," he said. But he stopped short of withdrawing from EU talks. "We will do everything we can to preserve peace but we will not allow anyone to jeopardize the security of our citizens." Kosovo split apart from Serbia in the late 1990s after NATO bombings ended an attempt to quash an uprising by ethnic Albanians against repressive Serbian rule. It formally declared independence in 2008. The European Union has demanded they normalize relations before Serbia can enter the bloc. In the late 1990s, the conflict in Kosovo was escalating as tens of thousands of people fled the region. After all efforts at pacifying the region failed, NATO began carrying out air raids on military bases and strategic targets in Serbia on March 24, 1999. Eleven weeks later, Serbian President Slobodan Milosevic finally gave in. In the mid 1980s, protests began in Kosovo against government attempts to curtail the rights of the Albanian majority. The reprisals worsened in the 1990s. Ibrahim Rugova, leader of the political movement in Kosovo since 1989, tried to make Milosevic change course using peaceful resistance - without success. An armed resistance formed in Kosovo. The self-appointed liberation army UCK started a brutal guerrilla war and carried out violent attacks against Serbs and Albanians whom they saw as collaborators. Serbia reacted with retaliatory measures: Houses were torched and shops plundered, as hundreds of thousands fled the region. As time passed, the war became ever more brutal. Serbian forces increasingly attacked civilians with the aim of breaking the UCK's resistance and its support among the population. Many people looked for refuge in the forests. Trains and trucks transport thousands of people to the borders - without passports or other documents which could prove that their home had been in Kosovo. Under the auspices of the US, France, the UK, Russia and Germany, the conflicting parties attended a conference in Rambouillet, France in February 1999 with the aim of working out a limited settlement guaranteeing Kosovo's autonomy. Representatives of Kosovo accepted the conditions of the deal, but their Serbian counterparts were not willing to make any concessions. The negotiations failed. On March 24, 1999, NATO began bombarding military and strategic targets in Serbia and Kosovo in order to stop the violence against Albanians. Germany joined the military action, known as Operation Allied Force. It was NATO's first war in its 50-year history - and that without the official backing of the UN Security Council. Russia sharply condemned the intervention. Next to military installations, NATO also attacked transportation networks such as railroad tracks and bridges. During the following 79 days and nights, the alliance carried out more than 37,000 operations with 20,000 rockets and bombs striking Serbian territory and killing countless civilians - what NATO referred to as "collateral damage." Industrial sites were also among the targets. NATO bombs hit chemical plants and a fertilizer factory in the town of Pancevo near the capital, Belgrade. Huge amounts of toxic substances made their way into rivers, soil and the air, with grave health consequences for the local population. Serbia accused NATO of having used depleted uranium ammunition, as well as cluster and fragmentation bombs. In order to deprive Slobodan Milosevic of his most important propaganda tool, NATO decided to attack Serbia's public television station in Belgrade. The Serbian government, although told of the attack in advance, withheld the information from the public. Sixteen people lost their lives in the bombing. In Kosovo, NATO bombs inadvertently hit a group of Albanian refugees, killing an estimated 80 people. More "collateral damage" occurred when NATO bombed the Chinese embassy in Belgrade, killing four people. The incident led to a severe diplomatic crisis between Beijing and Washington. In early June, communications out of Belgrade showed that Milosevic was finally willing to make concessions. NATO brought an end to its raids on June 19. During the air strikes, thousands of people were killed, 860,000 refugees were displaced and Serbia's economy and infrastructure were largely destroyed. Kosovo was placed under the administration of the United Nations. European Union foreign policy chief Federica Mogherini said on Twitter: "I deplore what happened today in Kosovo. Need calm & preserve dialogue." Kosovo President Hashim Thaci said Djuric had entered the country illegally and police responded appropriately. He called for calm and said the normalization process would continue. Thaci said the incident "should not interfere with ... the dialogue between the two countries, the efforts for normalization, good neighborly relations and reconciliation between Kosovo and Serbia." Kosovo has a population of 1.8 million people including 120,000 ethnic Serbs. The northern city of Mitrovica has been a hotspot for conflict with more than 50,000 ethnic Serbs living there and holding political allegiance to Serbia. Opponents of Serbian President Aleksandar Vucic rallied in Belgrade to demand his ouster. The protests, triggered by a brutal assault on an opposition leader, have been escalating for months. For months now, Serbs have been protesting against their president, Aleksandar Vucic. On Saturday, the situation deteriorated sharply: demonstrators stormed the state radio station and surrounded the presidential palace.